Designing your own container gardens is an easy way to personalize outdoor décor around your front door or porch, patio, deck, balcony, or other space. It can seem like an intimidating task—especially if you’re new to gardening. But good news: It’s actually easy! Here are some tips to get you started. One of the old-time gardening guidelines, it’s one that usually works. Start by picking a “thriller” plant–your focal point that attracts attention. Then accent it with a “filler” plant, or one that acts the same way baby’s breath does in a floral arrangement to provide texture. Finish your design with a “spiller” or two—a plant that tumbles over the edge, softening the pot. Used here: Pink angelonia, dusty miller, and petunia. 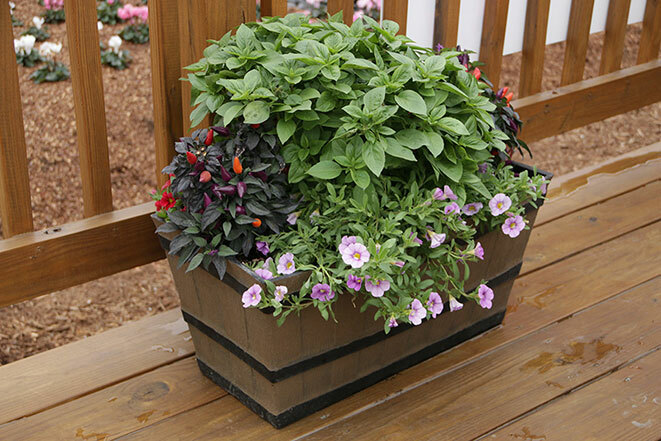 You know the old saying, “if one is good, two must be better?” It’s true when it comes to container gardens! 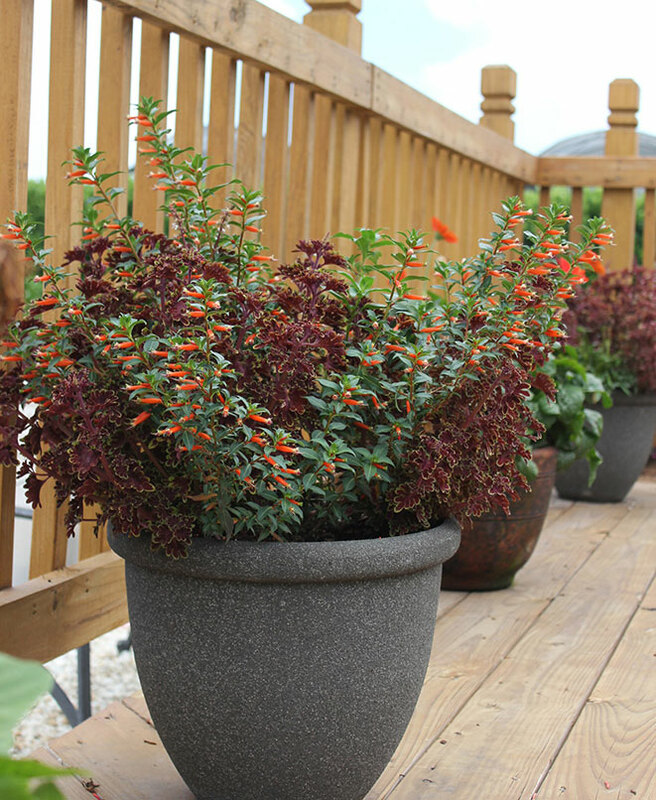 One pot can be fun, but creating a grouping offers much more impact. Play up the fun by using containers of different sizes. 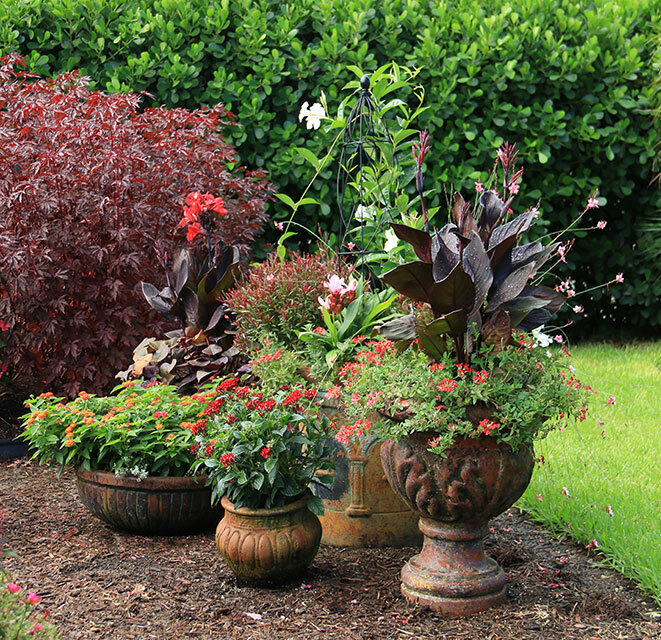 And get a consistent look by using the same plant or color throughout your containers. Used here: Red canna, purple sweet potato vine, orange lantana, red pentas, pink gaura, white mandevilla, red verbena, and pink curcuma. 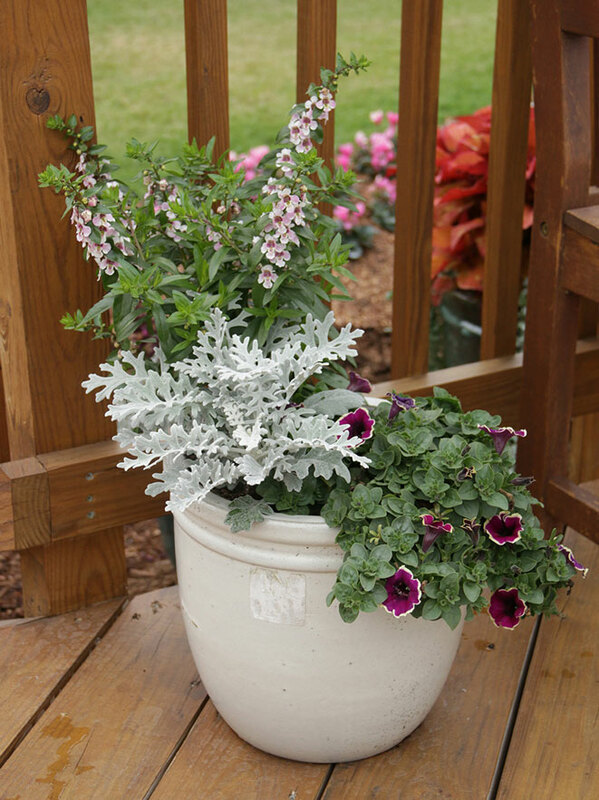 Enjoy a container that does double duty by mixing vegetables or herbs in with flowers. Some vegetables, such as eggplant, can be beautiful on their own. And most herbs, like basil or lemongrass, add a fun dash of texture to your planting. Used here: Ornamental pepper, basil, and purple calibrachoa. Want something a little more interesting than your everyday terra-cotta pot? Just about anything that holds soil can work as a container. Here, for example, we used an old clay drainage pipe with holes cut in to hold plants vertically. We topped it off with a big terra-cotta bowl. 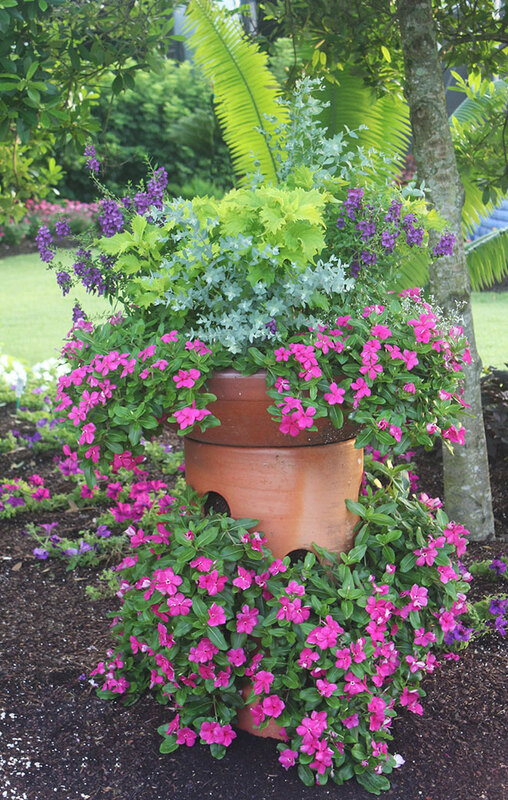 Used here: Purple angelonia, chartreuse coleus, eucalyptus, pink vinca. It’s easy—really easy—to get distracted by all the beautiful flowers to pick from. But don’t overlook how impactful foliage can be. Plants such as coleus, elephant’s ear, succulents, hostas, and crotons can all provide a big boost of color and interest without a single bloom. Used here: Cigar plant and red coleus.